Man, the Saturday slate is…ugly. The Redskins have an implied team total south of 14 points yet it seems likely you’ll need to play a Washington player or two in your lineups. Vernon Davis and Maurice Harris have already been announced out. Davis’ absence should mean more snaps/routes for Jeremy Sprinkle and Matt Flanagan. Sprinkle caught all of his three Week 15 targets for 19 yards and a touchdown and is the preferred option of the two. Matt Flanagan is almost sure to be largely unowned and is a fine GPP sprinkle (pun intended) on a slate with terrible options at the position. Maurice Harris was operating as the Redskins WR4 but did run 14 routes in Week 15. Darvin Kidsy seems most likely to fill in Harris’ role but he’s not even in the DraftKings player pool. I rank the four Redskins receivers options as follows: Jamison Crowder, Josh Doctson, Michael Floyd, Darvin Kidsy. Both Adrian Peterson and Chris Thompson can be used in GPPs. 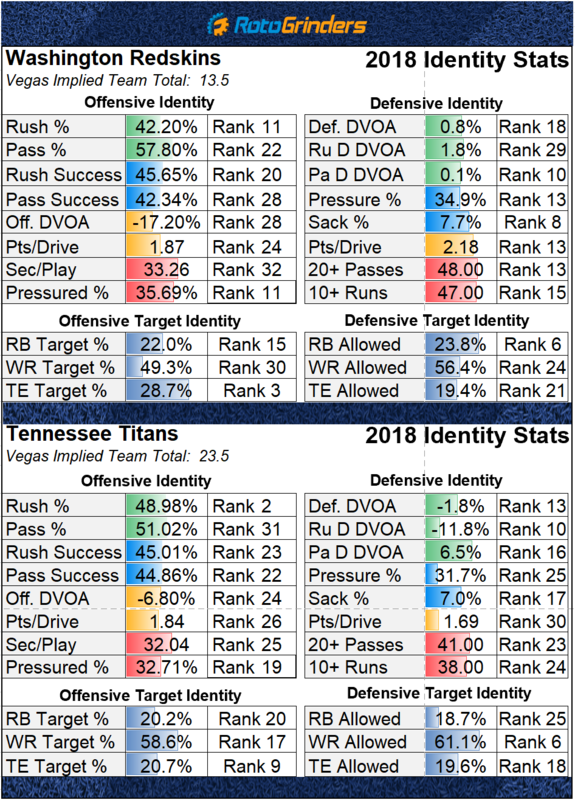 Derrick Henry has been an absolute monster for the Titans the last two weeks. He’s RB2 on the slate behind Melvin Gordon and you want to pay up for both guys in cash games. Henry makes for an ok GPP fade at his price but his ceiling is top two on the slate. Dion Lewis is RB3 on the slate and can be used alongside Henry in all formats. I will have plenty of GPP teams that roster Lewis but fade Henry. I rank the Titans receiving weapons as follows: Corey Davis, Taywan Taylor, Tajae Sharpe, Anthony Firkser. Davis and Taylor are playable in all formats. With Davis inactive, Firkser is TE1 on the slate in terms of raw projection – I prefer Sprinkle to Firkser in terms of points per dollar. This game contains the top two quarterback options on the slate. Lamar Jackson has shown a pretty solid floor as a starting quarterback – never dipping below 16 fantasy points in any of his starts. That floor is largely thanks to his legs as the rookie QB has at least 67 rushing yards in each of his five starts. Jackson’s inaccuracy and low total volume have killed any value Baltimore receivers previously had. I rank the Ravens receiving options as follows: Willie Snead, John Brown, Michael Crabtree. 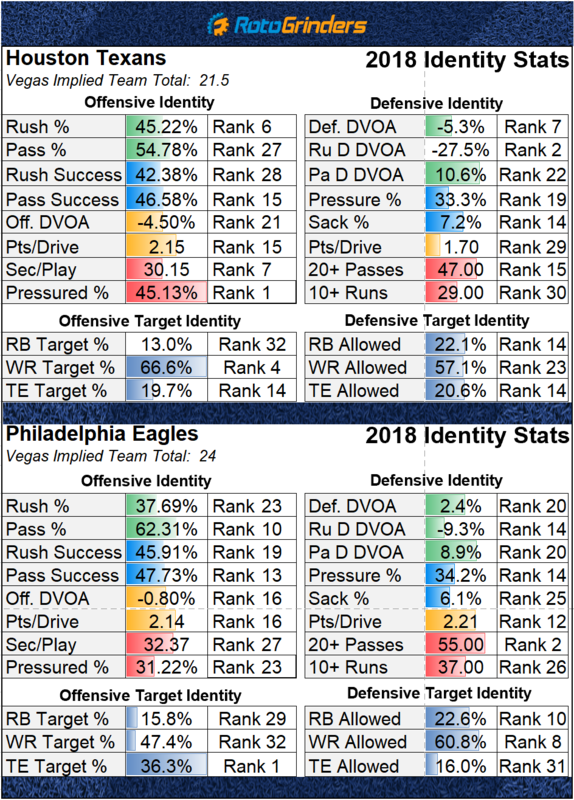 Feel free to play roulette with Nick Boyle, Hayden Hurst, and Maxx Williams in GPPs. Kenneth Dixon out-snapped Gus Edwards 39-to-33 in Week 15 but was out-carried 19-to-11. Gus Edwards ran three routes to Dixon’s 19. Edwards beats out Dixon in terms of raw projection but I prefer Dixon here – especially on FanDuel where Edwards is $2,100 more expensive than Dixon. Dixon simply has more outs if the Ravens are caught playing from behind. I’ll likely have very little exposure to Edwards and be overweight on Dixon. 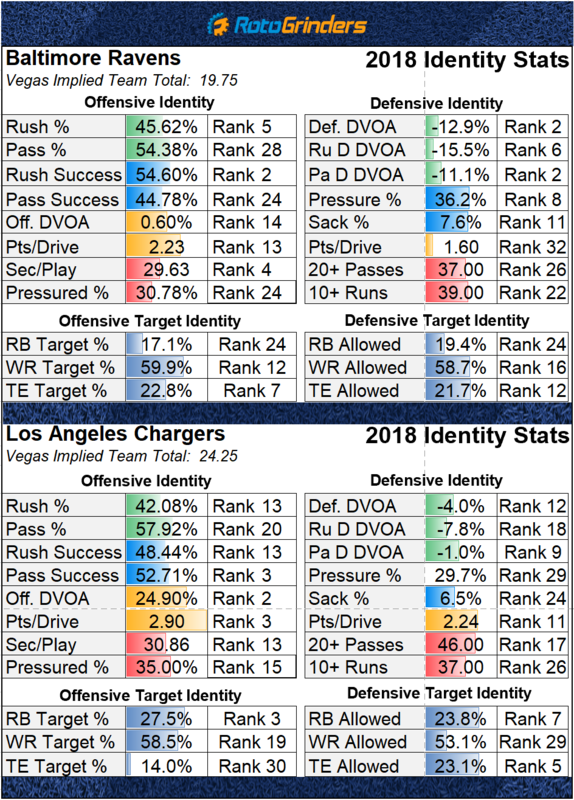 Phil Rivers is the QB you want in cash games but he’s also the most expensive option. I am fine settling with Lamar if you need the salary savings but do think Jackson is more of a secondary option. Melvin Gordon isn’t on the injury report and is easily RB1 on the slate. He is a cash game lock and should be in the majority of your GPP lineups – differentiate elsewhere. Austin Ekeler is out and Justin Jackson should act as Gordon’s backup. I wouldn’t be surprised if Detrez Newsome was used more than Jackson as he’s more suited to fill in the Austin Ekeler pass catcher role. Keenan Allen is expected to play and is the top WR on the slate by a wide margin. If Allen is active, Mike Williams will see a reduced role after his monster game against the Chiefs – I think he makes for a strong GPP fade at an increased price tag. Tyrell Williams is largely uninspiring – like the slate in general – but can be considered as a secondary option in all formats. Antonio Gates is in a battle with Firkser for TE1 on the slate – I would rather just save money at the position with Sprinkle. Ezekiel Elliott is the top play of Week 16’s main slate and it’s really not all that close. Elliott’s workload has been so massive that it’s hard to imagine a scenario barring injury in which he fails to post at least 20 fantasy points. In fact, Zeke is averaging 20.75 FanDuel points and 27 DraftKings over the last two games despite not scoring a touchdown in either. 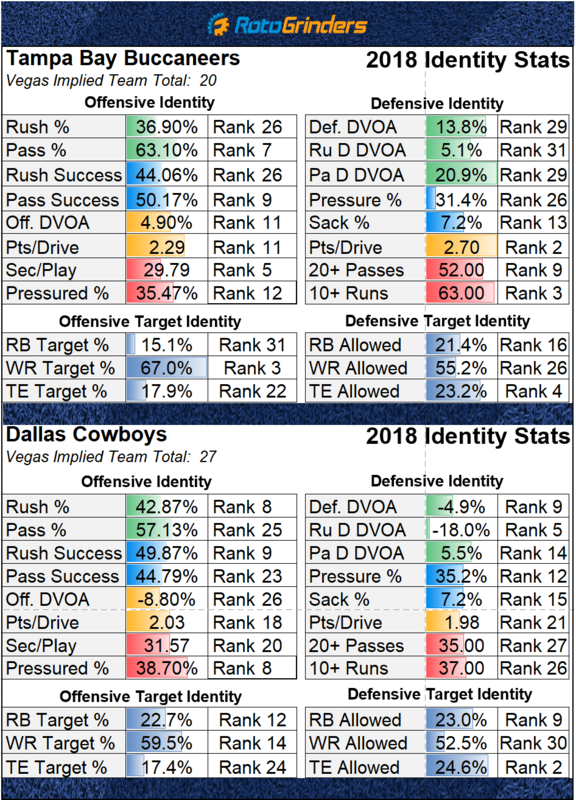 Elliott is a cash game lock and I’m unlikely to fade him in GPPs despite high expected ownership – I’ll just look to differentiate elsewhere. Dak Prescott’s cheap price tag places him in cash game consideration, especially on FD where he’s only $7,300. Amari Cooper is coming off a down game but is still too cheap on FD ($7,000) where he’s a secondary option. Cooper makes for a better GPP play on DK and Yahoo! – he’s priced as WR7 on Y! Which includes Sunday night’s shootout. Michael Gallup was a popular air yards play last week that massively disappointed as he wasn’t even targeted. I didn’t roster Gallup at all last week and am likely to do so this week – that said, he does make for a much better play this week simply due to significantly lower ownership than he saw in Week 15. Blake Jarwin has seen seven targets in back-to-back games as he’s clearly separated himself as the Cowboys pass-catching tight end. I think Jarwin makes for an okay secondary option – he’s priced at the bare minimum on Y! I am more likely to roster the Cowboys defense in cash games than I am to roster any pieces of this Buccaneers offense. It looks like DeSean Jackson is likely to be active this week after missing a couple of weeks with a thumb injury. Him being active would make Chris Godwin unplayable even in GPPs. Jameis Winston and/or Mike Evans can be used in GPPs but I wouldn’t use them in anything other than game stacks. Cameron Brate is an uninspiring GPP option. 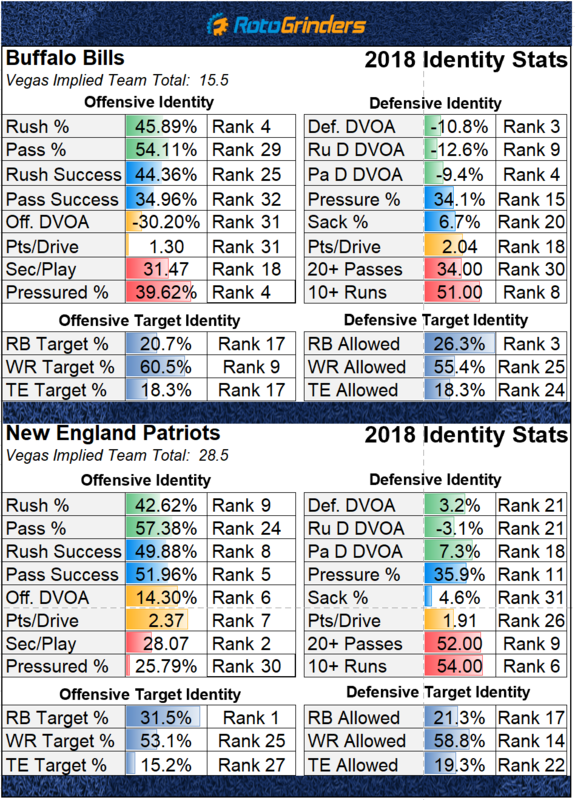 The New England Patriots defense will be the most heavily owned DST on DK where they’re inexplicably priced at $2,500. I have no interest in any parts of this Bills offense in any format. No, not even Robert Foster. The Patriots will play the remainder of the season without Josh Gordon who is an underdog to play another snap in the league at this point. Gordon leaves behind a healthy share of targets and a 23.1% market share of air yards. Cordarrelle Patterson and Phillip Dorsett are likely to be the biggest beneficiaries strictly in terms of playing time. They were limited to just four routes run and one route run respectively in Week 15. I am not entirely sure that Chris Hogan really sees a significant increase in value as Brady just doesn’t seem to want to target him regardless of who is on the field. With that said, Hogan is cheap enough where he does deserve at least some GPP consideration, even if you’re only rostering him on 5% of your teams. Julian Edelman’s already large role will be even more solidified with Gordon’s absence. Edelman makes for a fine secondary option and will likely go overlooked due to the strength of the high priced receiving options. I am going to continue to short Gronkowski. Gronk continues to run routes but I’m simply not confident that he has much upside on his price tag. New England running backs make for an easy fade for as long as all three remain healthy and active. Ito Smith was placed on IR which should result in an increased workload for Tevin Coleman. Coleman looked #good in Week 15 as he carried the ball 11 times for 145 yards and a touchdown. However, Coleman was only targeted once and remains relatively uninvolved in the passing game. There’s speculation that Brian Hill could cut into Coleman’s workload but I’m still of the opinion that Coleman is a strong secondary option for his price tag. Cash game roster construction this week lends itself to paying up for Zeke and Saquon and then saving at the third running back position in the flex. Coleman is in the mix for that third spot. It sounds like Julio is more likely to be active than not this week. Everyone remembers Julio’s monster 12 catch, 300-yard performance in 2016 but he has struggled versus the Panthers since posting the following lines: 4/60, 6/118, 5/80, 5/64. Someone with as big of a target share as Julio’s always makes for a strong GPP option but I’m likely to be underweight on him this week. I’m not against a Matt Ryan / Tevin Coleman / Julio Jones stack in GPPs. Taylor Heinicke will get the start for the Panthers and is priced at the minimum across the industry. Any other week and I might at least have minor interest in taking a shot in the dark on Heinicke in GPPs but there’s not a big enough price gap between Heinicke and Nick Foles for me to really consider him. Christian McCaffrey has been on the field for 97%+ of the Panthers offensive snaps this season but this is a tough spot to trust him in. It’s hard for him to see a significant increase in target share and it seems likely the Panthers offense will just be wholly inefficient which kills McCaffrey’s touchdown equity. I’ll be short McCaffrey this week. D.J. 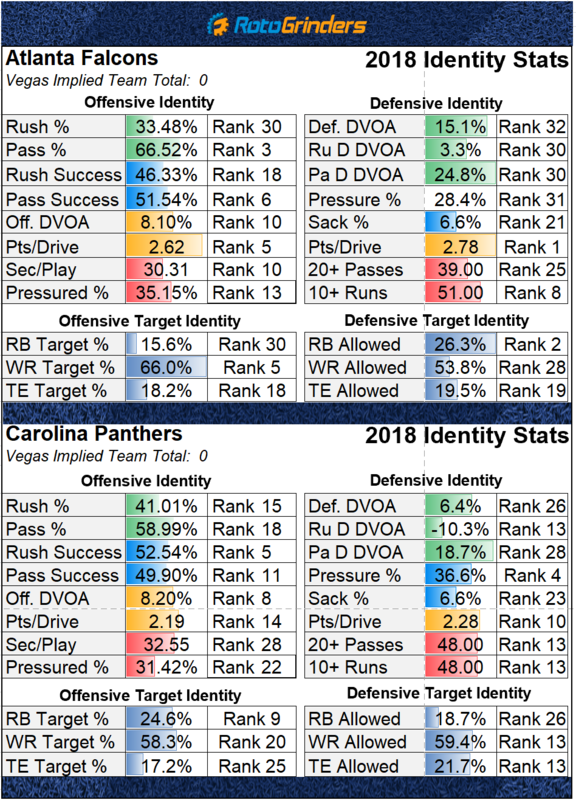 Moore and Curtis Samuel are the only Panthers receiving options that you can remotely consider in GPPs and neither option is particularly strong. Leonard Fournette disappointed in Week 15 as he carried the ball 11 times for 46 yards and caught three balls for another 18 yards. Fournette only touched the ball once in the second half as the Jaguars insisted that was “part of the game plan”. Fournette and the Jaguars get a Week 16 matchup against a Dolphins defense that was just absolutely shredded by the Vikings on the ground. There’s no certainty surrounding Fournette’s workload but I think he makes for a strong GPP play this week as a gamble on him getting 20+ touches at low single digit ownership. Cody Kessler continues to start for Jacksonville. Dede Westbrook and Donte Moncrief are both seeing a healthy share of targets and market share of air yards with Kessler under center. Neither guy is playable in cash but Westbrook is a weekly GPP option. The invincible Frank Gore injured his foot in Week 15 and will sit the remainder of the season out. That opens the door for Kalen Ballage and Kenyan Drake – the former of whom should fill-in for Gore’s early-down role and the latter whose role will likely go unchanged. I’m unlikely to have exposure to either guy this week but I would roster Ballage over Drake if forced to choose. Kenny Stills has won people a lot of money this season with big performances in Week 1 and Week 14. Stills has the upside where he’s a weekly GPP option. I’m not interested in any other part of this Dolphins passing game. Saquon Barkley is $7,900 on DraftKings. That’s too cheap. Barkley will be a staple of my cash game lineups on DK and a core piece in my GPP construction. Barkley is RB2 this week in terms of raw projection and is a secondary option even on site’s where he’s priced up. Odell Beckham is out for this game which once again opens up targets for Sterling Shepard and Evan Engram. Shepard stands out as the better play for his price and can be used in cash games. Engram is a strong option that can also be used in cash games but only where he offers a significant discount from the high priced options. Eric Ebron is only $400 more than Engram on FD and is the preferred option there. Eric Ebron projects behind George Kittle and Zach Ertz this week but offers a significant discount to both of those guys on DraftKings and Y! Ebron is a cash game option and the strongest play on the Colts this week. T.Y. Hilton is once again questionable this week and is best left for GPP’s if active. Andrew Luck is a viable option in all formats. Marlon Mack parlayed 27 Week 15 carries into 139 yards and two touchdowns. Mack is game script dependent which makes him best left for GPPs. 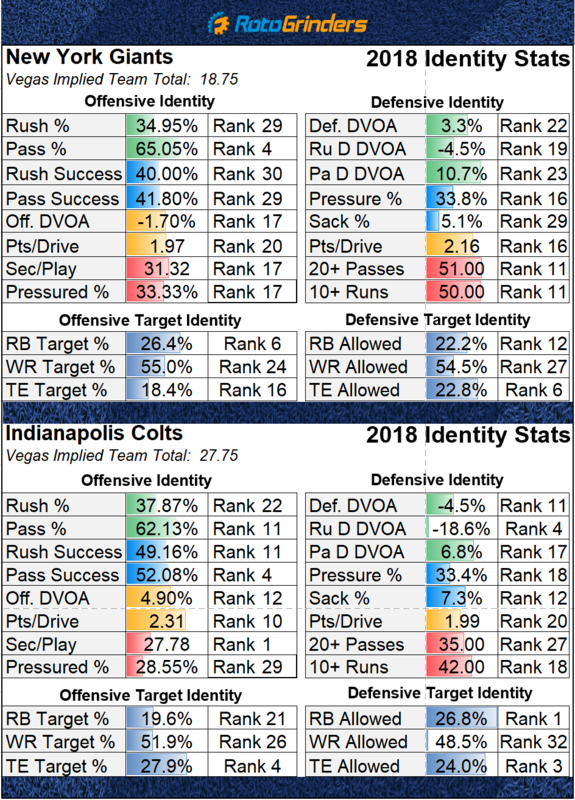 Notably, the Colts are 10-point favorites which should mean good things for Mack’s workload. Nick Foles took a battered Eagles team into Los Angeles and stole a win against the Rams as massive underdogs. As a result, Foles and the Eagles are now Week 16 home favorites against a 10-4 Texans team. Speaking of Foles, he’s extremely cheap across the industry. I’m unlikely to play Foles in cash games but don’t think it would be egregious to do so. Alshon Jeffery wasn’t active for the first two games Foles started early in the season but was targeted eight times in Week 15. Alshon caught all eight targets for 160 yards. Alshon makes for a strong low-to-mid tier option in all formats. Zach Ertz is TE1 this week in terms of raw projection but is also priced as such on FanDuel. If you’re looking to get exposure to Ertz it’s best to do so on either DK or Y! DeAndre Hopkins is a man-child. Hopkins doesn’t fit my current cash game lineup construction but is the top overall WR option on the slate. I will be using him in GPPs and as part of game stacks. Deshaun Watson is a secondary option that can be used in all formats. Lamar Miller is listed questionable for this game with an ankle injury. If Miller is inactive we could see D’Onta Foreman for the first time this season. Regardless of Miller’s status, I won’t have any exposure to Texans running backs this week. Last week was set up for the Vikings run game to shine and it did as Dalvin Cook totaled 163 yards and two touchdowns on 19 carries and one reception. This is a tougher spot for Cook against a Lions defense that has been better against the run ever since they acquired Snacks Harrison. The Lions also play at such a gross pace that they limit the number of plays their opponents run which hurts individual players volume. Adam Thielen is the one Vikings player I would consider in cash and only on FanDuel where his price has fallen to $7,600. Kirk Cousins and Stefon Diggs can be used in GPPs. 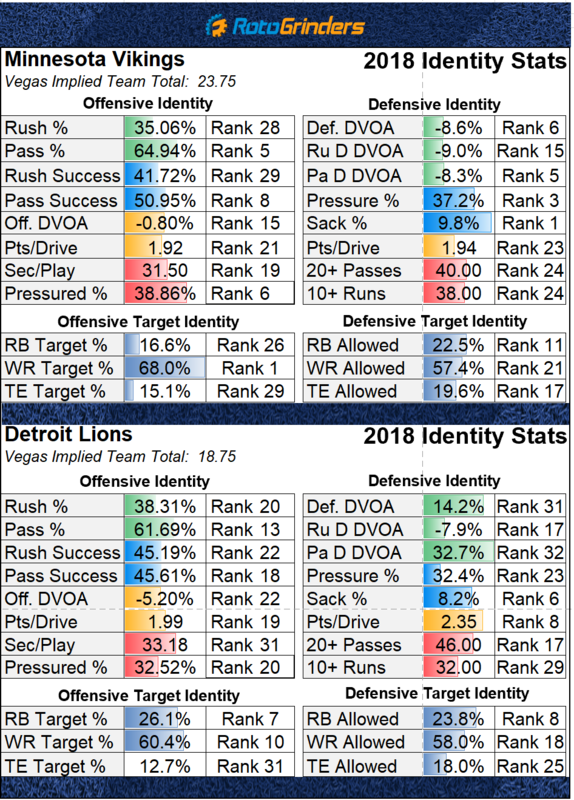 Kenny Golladay remains the only playable piece of this Lions offense. He is questionable this week with a chest injury – he’s a GPP option if he’s active. Aaron Jones was placed on IR which means Jamaal Williams will likely be used as the Packers workhorse RB. Green Bay did sign Kapri Bibbs earlier in the week. Bibbs could cut into Williams’ passing game role but Williams still makes for a strong value option at RB and can be considered in all formats. Davante Adams has absolutely dominated market share of both targets and air yards this season as he’s Aaron Rodgers most reliable weapon. Adams has shown a tremendous floor and is a cash game option if you’re looking to pay up at the WR position. It hurts me to say this, but Rodgers hasn’t shown a high enough ceiling for me to have much interest in him in GPPs. You know it’s a weird week when two New York Jets players can be considered cash game options. Elijah McGuire has emerged as the Jets lead back as he’s topped 17 carries in each of the last two weeks and should be in line for a similar workload again this week. I rank McGuire behind Tevin Coleman and Jamaal Williams but do think McGuire is a solid play this week. Robby Anderson is one of the top value options at receiver. Anderson is simply too cheap for the volume he’s been seeing – he saw 11 targets last week and seven targets each in Week 14 and 13. The target volume gives Anderson a strong floor for his price tag and he has the big play ability that gives him a strong ceiling as well. 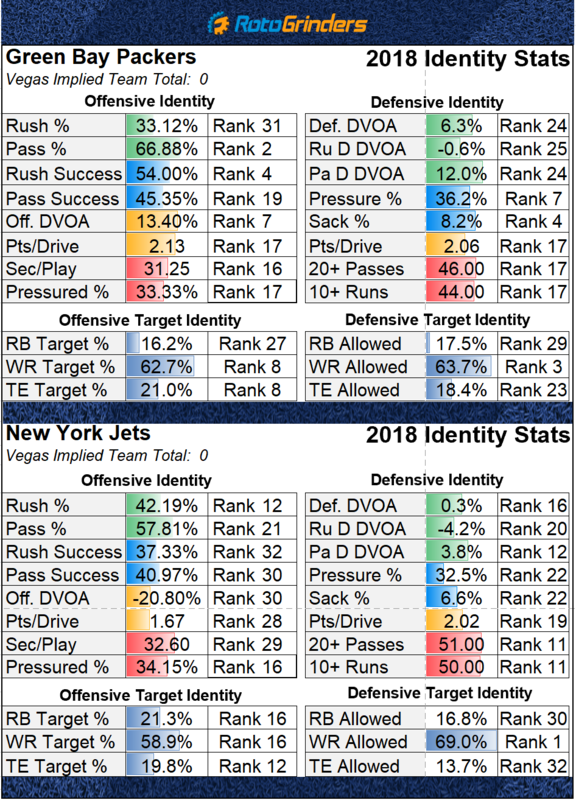 Chris Herndon is the only other part of this Jets offense that I would consider rostering and he’s best left for GPPs. Jeff Driskel’s favorite weapon, Tyler Boyd, has been declared out for this week leaving an already depleted receiving corps even more depleted. I don’t have enough faith in Driskel to confidently roster anyone other than C.J. Uzomah who is one of the better value TE options of the slate. This is what we call a #smash spot for Nick Chubb. 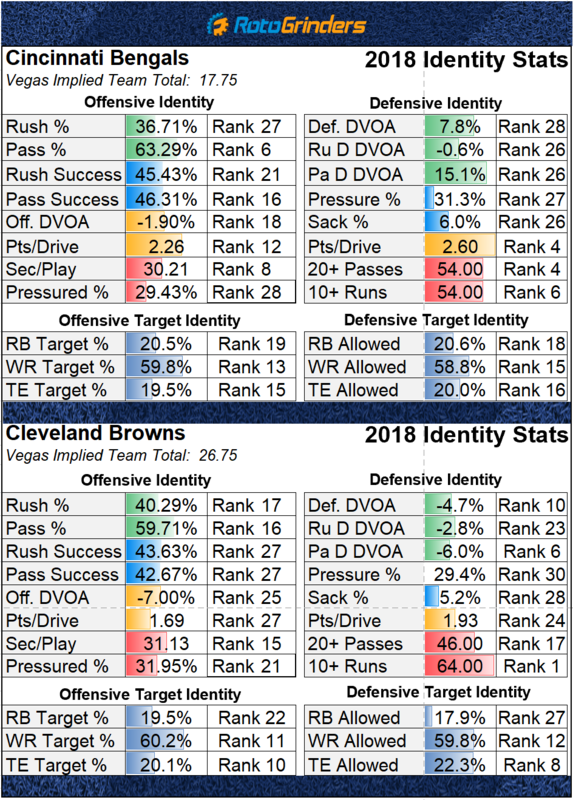 Chubb hasn’t had a single-digit fantasy performance since Week 8 against the Steelers and he should see plenty of volume as the Browns are 8.5-point home favorites. Chubb is the top “second-tier” option and should rightfully see heavy ownership this week. He’s playable in all formats. Baker Mayfield shouldn’t be needed much in this game but it is a good matchup for him and his receiving weapons. 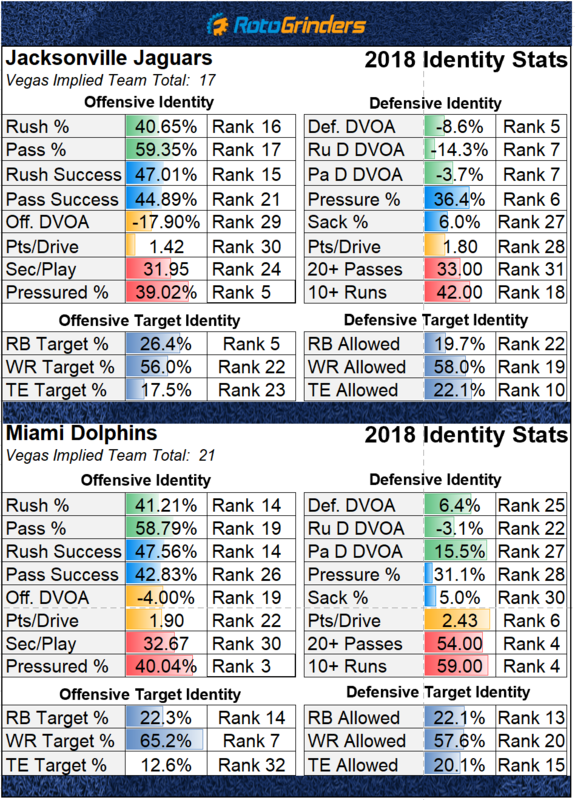 Mayfield, Jarvis Landry, David Njoku, and Antonio Callaway can be used in GPPs. 14-point favorites. Implied team total north of 30 points. Todd Gurley a serious game-time decision who is likely to be limited even if he’s active. Patrick Peterson questionable. This sure seems like a get right spot for Jared Goff who is coming off a couple of dreadful performances in a row – he’s thrown zero touchdowns and five interceptions in the last two games. Stacking the Rams passing game is one of my favorite approaches to GPP roster construction this week. Robert Woods is my favorite receiving option as he has run 70% of his routes in the slot since Week 11 with Cooper Kupp inactive. Woods is a fringe cash game option. The Rams reliance on three wide receiver sets hasn’t changed which has resulted in Josh Reynolds being on the field for nearly every snap. Reynolds is one of the stronger value receiving options on the week but I’m unlikely to use him in any format other than GPP. I do prefer Brandin Cooks over Josh Reynolds in terms of raw projection but Reynolds does stand out as a better point per dollar play. The Cardinals offense continues to be a mess. David Johnson should be in line for 20+ touches if Arizona is able to keep this a relatively close game but that’s a big if. DJ is a mere $6,200 on DraftKings which is enticing to me. He’s not cheap enough elsewhere for me to have much interest in him. Ricky Seals-Jones continues to run a crap ton of routes but that hasn’t translated to much. 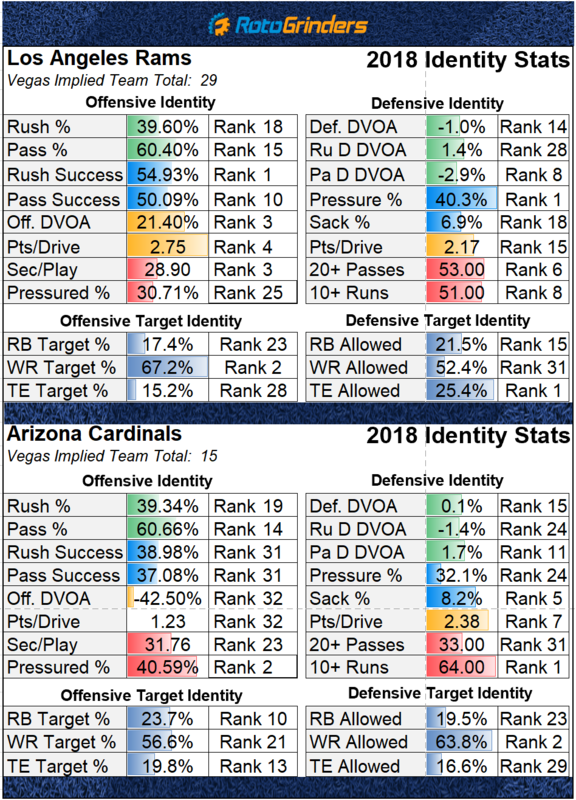 Still, if RSJ is able to play this week (he’s questionable with an illness) I will have exposure to him in GPPs in hopes that Rosen finally starts targeting him. UPDATE: Matt Breida resumed the lead back role in Week 15 as he was on the field for 45-of-62 offensive snaps and ran 22 routes. 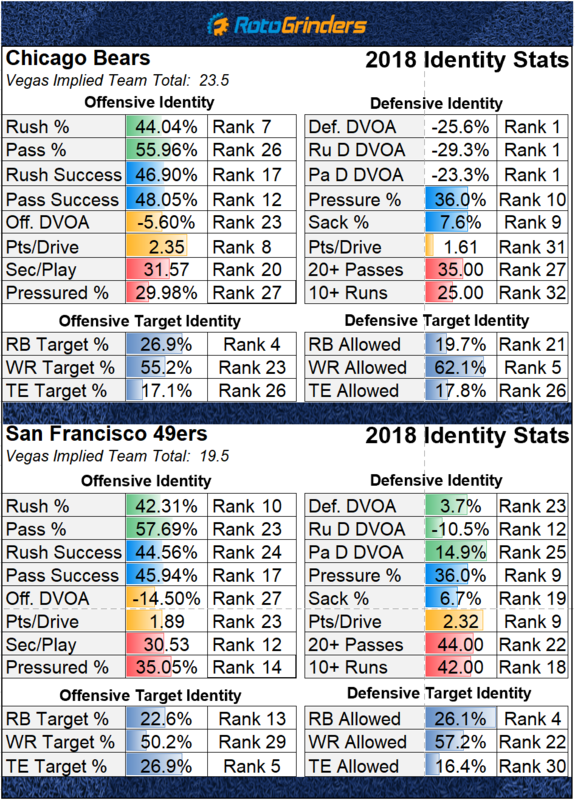 Breida is cheap enough across the industry where I think he can be used as a secondary option. I feel like this is going to be a bit of a contrarian take but….I don’t really like this game. At all. The 49ers are playing well enough defensively that I don’t have much interest in figuring out which piece of the Bears offense, if any, will have a good game. I’m also not interested in playing Nick Mullens or any of his weapons against the top defense in the league. The big news surrounding this game is the availability of JuJu Smith-Schuster. JuJu would be a top WR option this week if there weren’t any health concerns but there’s enough concern surrounding his health that even if he is active for this contest I want to avoid him. Smith-Schuster’s absence or possible limitations make Antonio Brown an intriguing GPP option as the volume should be there but efficiency could be a real concern as Brown would likely draw double-coverage if JuJu is off the field. James Washington is JuJu’s direct backup but Washington was already on the field for 30-of-38 Big Ben dropbacks in Week 15. Eli Rogers and Ryan Switzer are the guys that are in line to gain the most in terms of snaps and routes run if JuJu is inactive. In Rogers first game off the PUP list, he was on the field for 28 offensive snaps and lined up in the slot on 24 of them. Slot cornerback PJ Williams remains the Saints CB we want to pick on and Rogers is likely to line up across from him the most if Juju doesn’t suit up. If JuJu is inactive, most people will flock to roster James Washington but I’m more interested in Eli Rogers. Both are fine GPP options but I prefer Rogers based on matchup and projected ownership. James Conner is out again in Week 16 which means more action for Jaylen Samuels. Samuels is simply way too cheap on Yahoo! ($14) and someone that should be a core piece of your lineups. The Steelers RB is priced more appropriately on FD and DK where I would consider him a strong play but not a lock. Big Ben is a strong GPP option. The last time I thought to myself “Man, I know Ingram is involved, but Kamara is just too cheap” was back in Week 9 when the Saints hosted the Rams and Kamara topped 30 fantasy points. Well, Kamara is just too cheap. 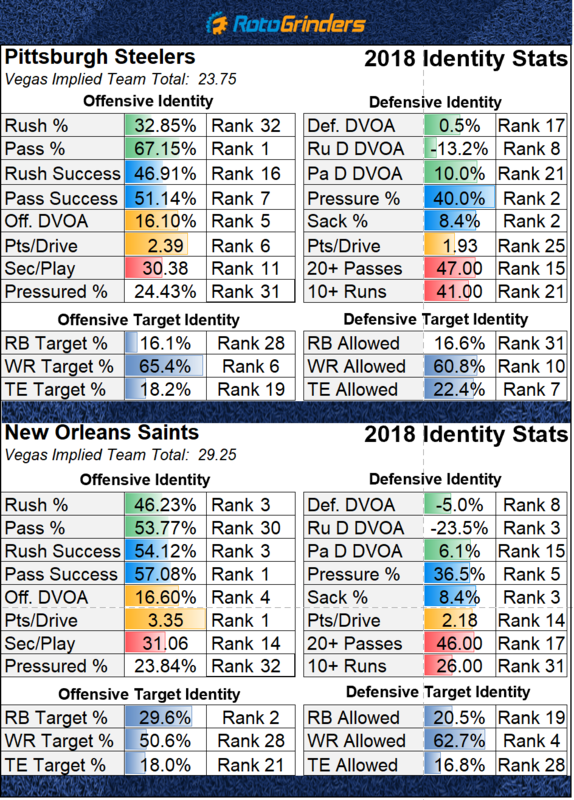 Ingram’s presence does make Kamara tough to justify in cash games but I’ll be overweight on Kamara in GPPs. This seems like a good bounce-back spot for Brees and his weapons as the offense has struggled to click the past few weeks. Brees can be considered in all formats as can Michael Thomas who is a top three wide receiver option on this slate. Tre’Quan Smith is a boom or bust GPP flier.